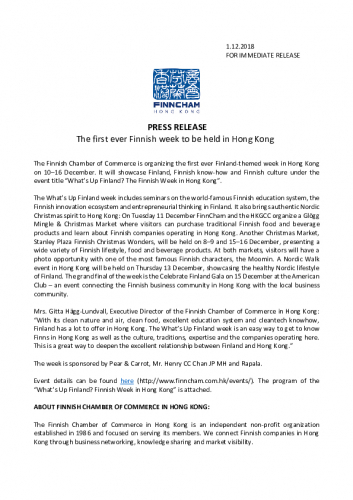 The Finnish Chamber of Commerce is organizing the first ever Finland-themed week in Hong Kong on 10–16 December. 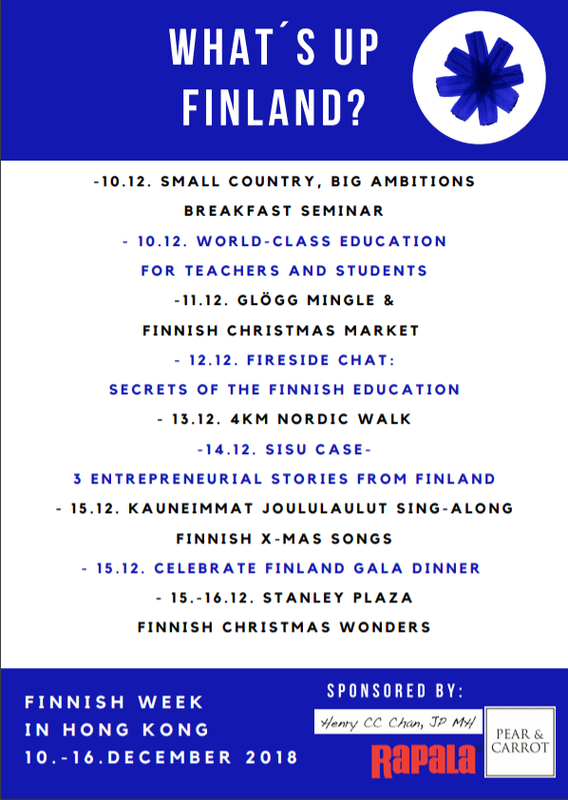 It will showcase Finland, Finnish know-how and Finnish culture under the event title “What’s Up Finland? The Finnish Week in Hong Kong”. The What’s Up Finland week includes seminars on the world-famous Finnish education system, the Finnish innovation ecosystem and entrepreneurial thinking in Finland. It also brings authentic Nordic Christmas spirit to Hong Kong: On Tuesday 11 December FinnCham and the HKGCC organize a Glögg Mingle & Finnish Christmas Market where visitors can purchase traditional Finnish food and beverage products and learn about Finnish companies operating in Hong Kong. Another Christmas Market, Stanley Plaza Finnish Christmas Wonders, will be held on 8–9 and 15–16 December, presenting a wide variety of Finnish lifestyle and food and beverage products. At both markets, visitors will have a photo opportunity with one of the most famous Finnish characters, the Moomin. The first ever Nordic Walk event in Hong Kong will be held on Thursday 13 December, showcasing the healthy Nordic lifestyle of Finland. The grand final of the week is the Celebrate Finland Gala on 15 December at the American Club – an event connecting the Finnish business community in Hong Kong with the local business community. The week is sponsored by Pear & Carrot, Mr. Henry CC Chan JP MH and Rapala. Event details can be found here (http://www.finncham.com.hk/events/). 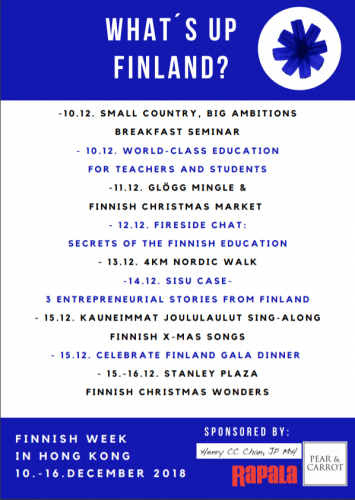 The program of the “What’s Up Finland? 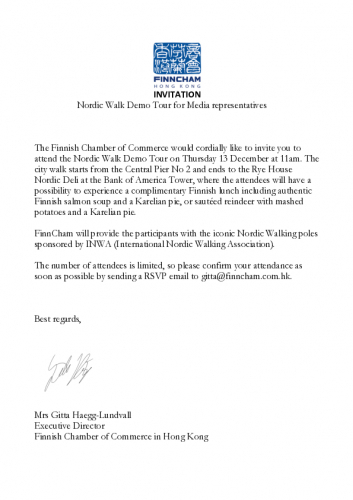 Finnish Week in Hong Kong” is attached. The Finnish Chamber of Commerce in Hong Kong is an independent non-profit organization established in 1986 and focused on serving its members. We connect Finnish companies in Hong Kong through business networking, knowledge sharing and market visibility.